Guarded by the towering Velebit mountain range in the east and hugged by the Istria Peninsula in the northwest lie the Kvarner bay islands. Quiet coves of crystal clear water surround the dramatic landscapes of the Kvaner bay islands; green hills and rocky moon landscapes give way to small harbor towns rich in history and culture. Discover the charm of the Adriatic Sea for yourself by bike and boat on board one of our romantic motor yachts. The day begins with a well-rounded breakfast leaving you fit to explore the diversity of the Kvarner bay islands on a guided bike tour. 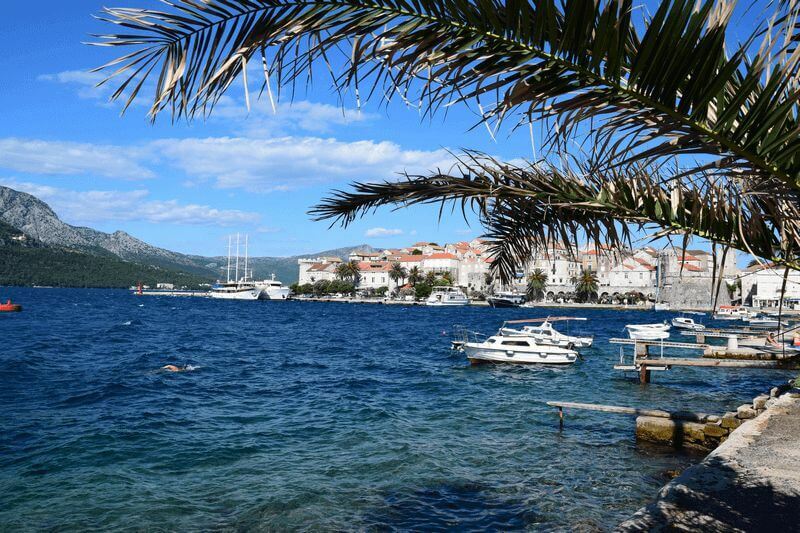 Be it the medieval city of Rab, the car-free road in the sky on Dugi Otok or the contemplative life of the dwellers on the flower island of Molat, each day brings with it new discoveries. Evenings are mostly spent in picturesque harbor towns with winding alleyways where a great range of bars and cafes stand host for a relaxing evening. The friendly crew will always make sure that you enjoy an easy-going journey. 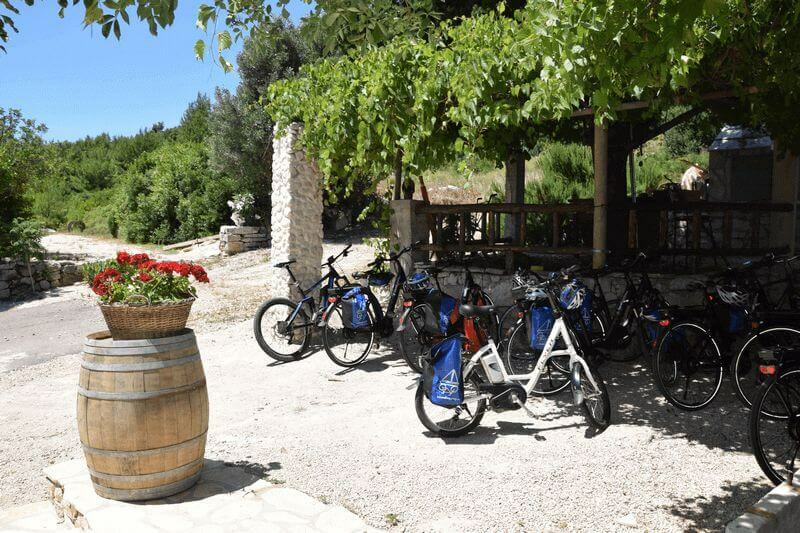 This tour will often be operated on the same boat as the mountain bike cruise “Kvarner Bay” and one tour guide attends trekking bike group while the other one leads the mountain bike group. Due to changing wind and weather conditions as well as organizational requirements the tour could be conducted in reverse order. The tour details are barring changes, a.o. as a result of nautical, technical or meteorological reasons. We reserve the right to make changes to the itinerary, depending on wind and weather conditions or organizational requirements. Sometimes the tour will be conducted in reverse order. Individual arrival in Omišalj, a nice little harbor village on the island of Krk. If you’re planning to arrive by car, we will organise a safe parking space for you. Check-in on the motor yacht between 2 and 2.30 pm.. At approx. 3 pm. the ship takes us to the island of Cres in about four hours. On Cres we take a walk through the Venetian old town in the evening. In the morning our ship will cross you over to Martinšćica. From here we will cycle on the east side of the island among pine, fig and laurel trees to Osor, the artist town, where we have lunch on the ship. Afterwards there is time for a swim in the bay with its crystal clear water. In the afternoon we leave Osor on board the boat and navigate our way to the island of Lošinj. After a comfortable cruise and a refreshing swim stop the ship brings us safely into the large harbor of Mali Lošinj. The clear climate of this wellness retreat with its colorful captain’s houses and an abundance of cafes welcomes us for a relaxing evening, enabling us to unwind and recuperate. 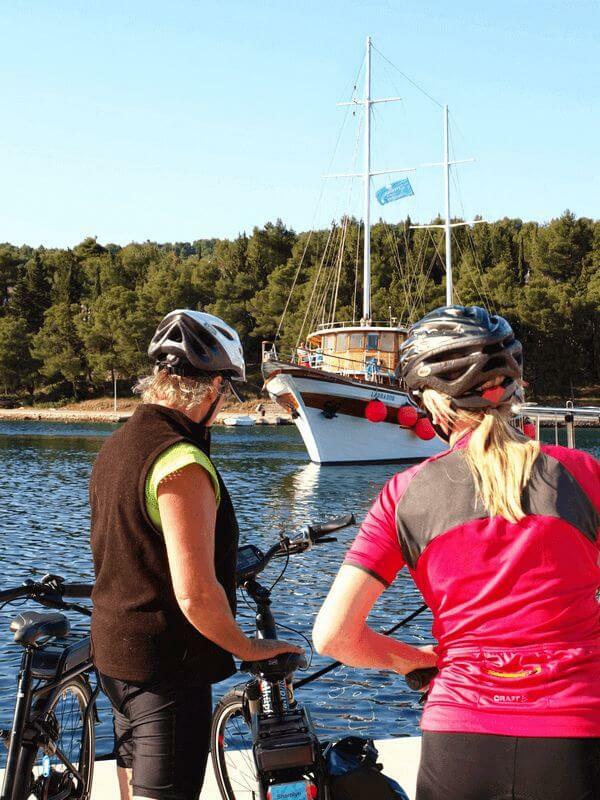 We cycle along the seaside promenade to the south of Lošinj and visit the picturesque small harbor of Veli Losinj before we will meet the ship for lunch. 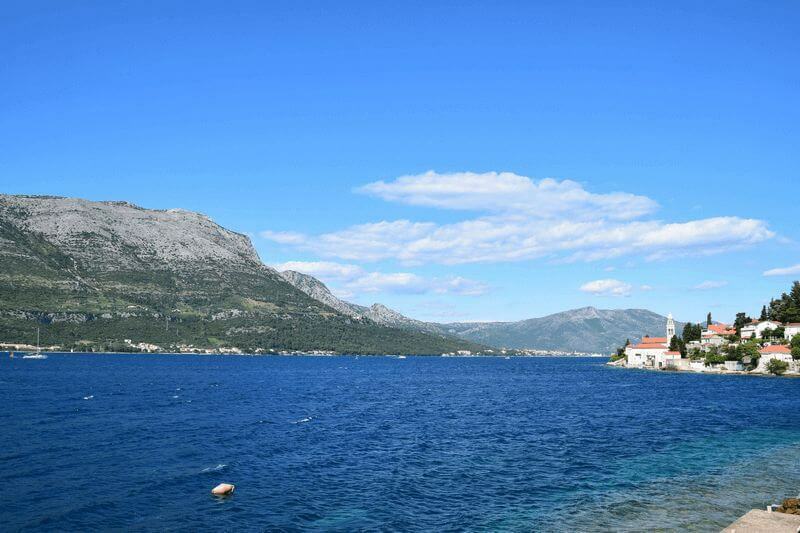 In the afternoon we cross over to the island of Molat, where we can do another short cycling tour. Finally we stay overnight in the quiet harbor of Molat. During breakfast the ship leaves Molat and takes us past many small islands to the “spice island” of Dugi Otok. 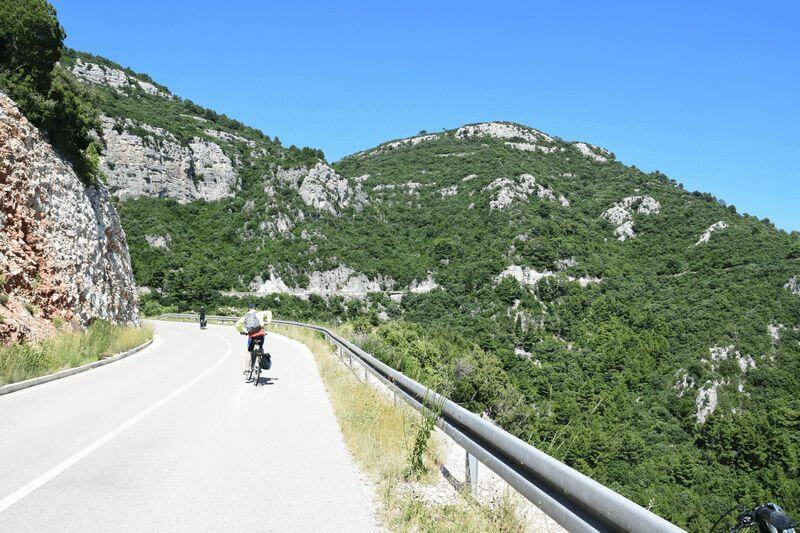 Our bike-tour starts in the bay of Božava, which is surrounded by pine woods, agaves and tamarisk trees, and we ride on a road almost free of traffic. Our tour leads us at first to the northern most point of the island where the light house of Veli Rat stands proudly since 1849 fulfilling its duty in guiding sailors safely on their way. A ride along the islands “Road in the Sky” brings us to the peaceful harbor of Savar or Bribinj. There will be ample time for a swim break in the afternoon. Overnight stay in a calm bay. After a crossing in the morning we reach the island of Pag. In the harsh but delightful landscape of the island we come across many fig and olive trees. Over the centuries the inhabitants have built numerous stonewalls for protection against the wind. 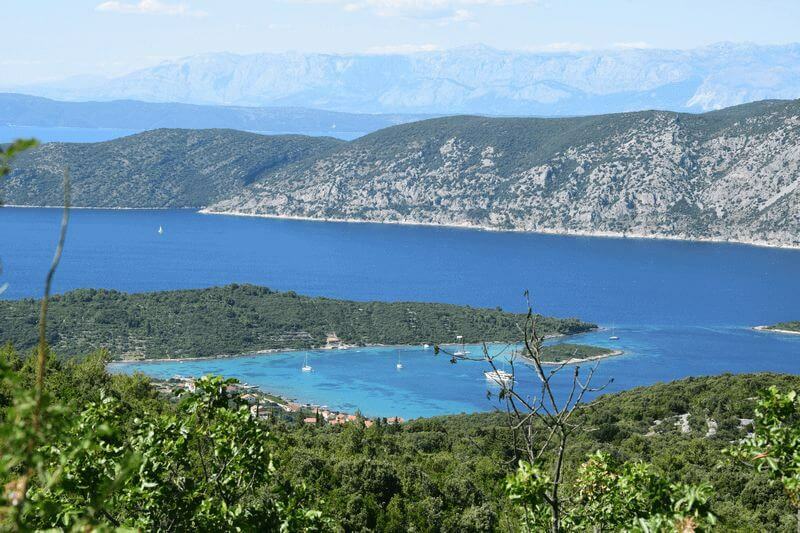 Starting in Mandre we cycle on the narrow peninsula until we reach the sea from where the ship takes us to Rab. 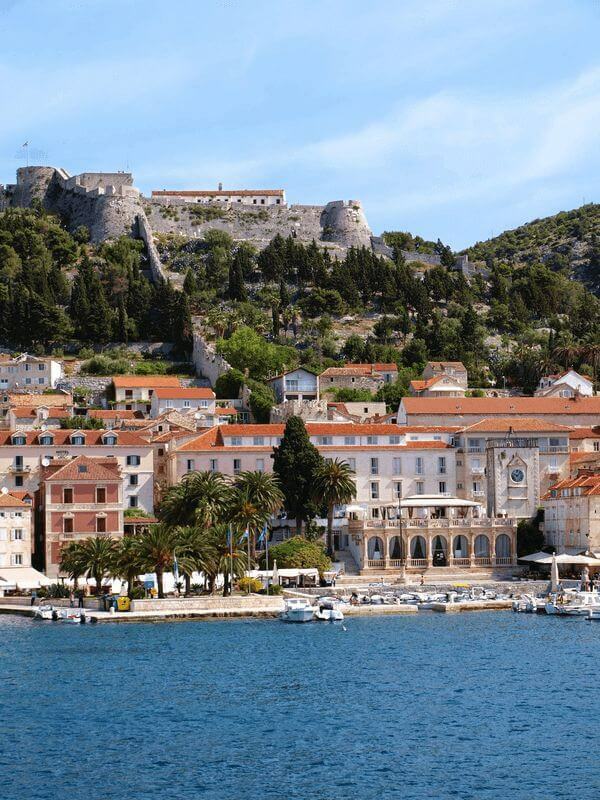 The island of Rab is one of the sunniest places in Europe. 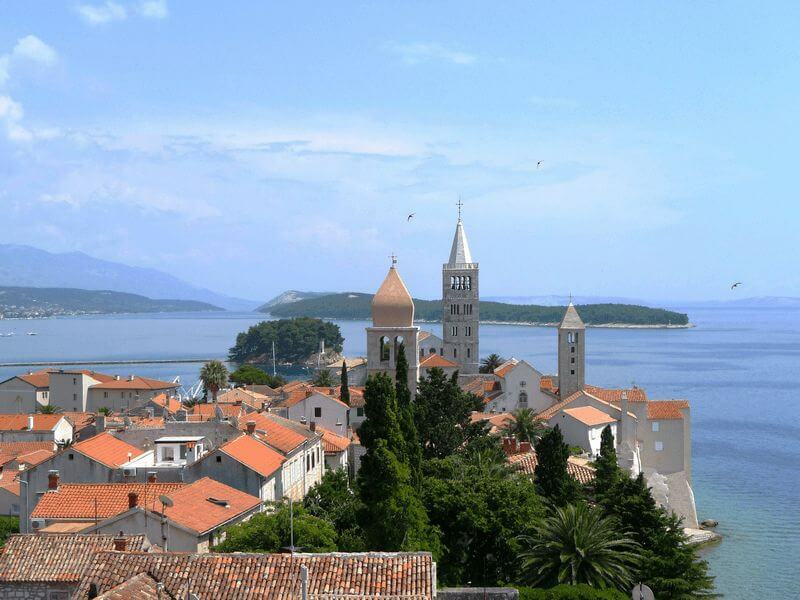 The town of Rab, the fortified capital of the island, was built in the Middle Ages on a wedge shaped headland and marks one of the highlights of the trip. The four famous bell towers are the symbol of the adorned beauty of the town. After dinner we can explore the narrow alleys with numerous cozy cafés. We cycle along the coast to the east side of the island, an area with virtually no vegetation, which’s rough and cliffy rocks remind of lunar landscape. The road leads us to a bay with a sandy beach, which is rather atypical for the islands of the Kvarner Bay. At lunchtime the ship awaits us in the harbor directly in front of the old town of Rab. After a swim-break the ship takes us over to the neighboring island of Krk, where we spend the evening in the historical town of Krk. 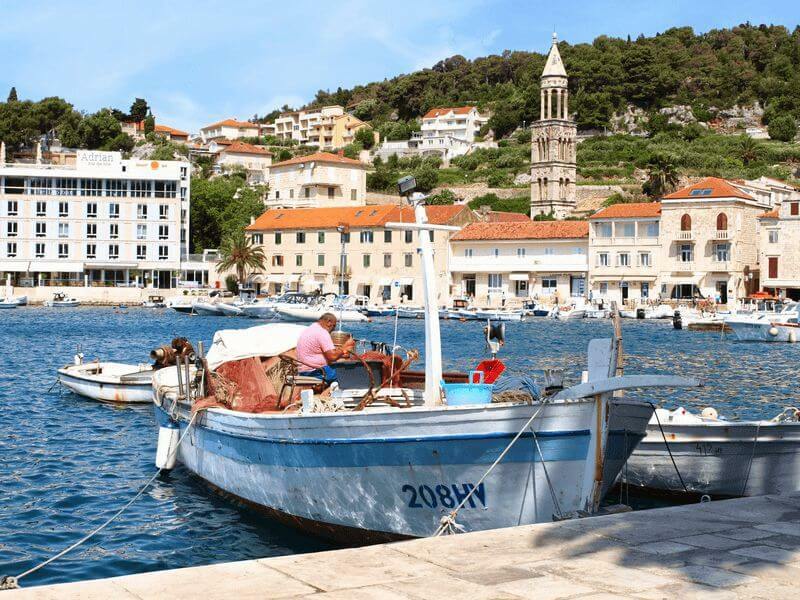 We cycle over the ridge of the island, which is covered by fragrant “macchia” to a valley of vineyards and then onwards to the small museum town of Vrbnik in the northeast. The town, built on a 50-meter-high cliff and surrounded by vineyards, is the home of the famous white wine, Žlahtina. Another peculiarity that Vrbnik has to offer is the second narrowest alley in the world. 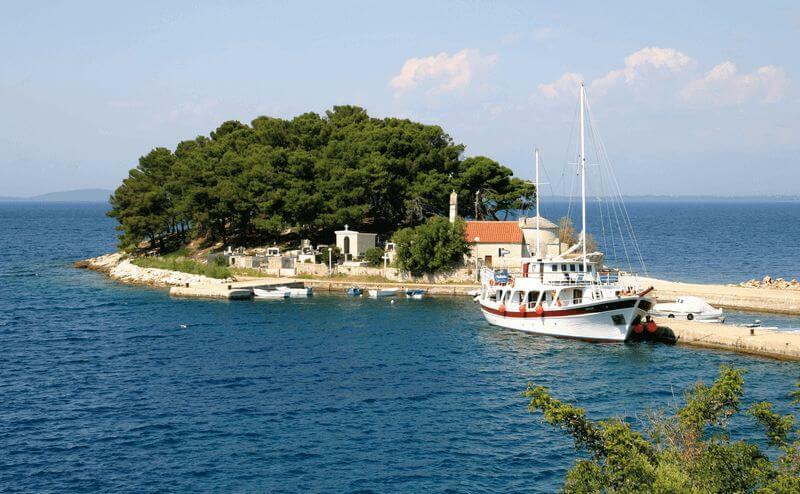 The way leads us across the island through old villages and rich vegetation to Omišalj. On the way we have a chance to swim in the bay of Soline. A cheerful evening meal on board the boat gives you time to celebrate the success of the week with fellow travellers and tour guides. After breakfast disembarkation until 9 am. and individual trip home. Due to our international audience all tours are conducted bilingually, in English and German. The on-board chef is a member of the crew and prepares the breakfast and one or two warm meals a day. The catering consists of 4 x full board and 3 x half board. 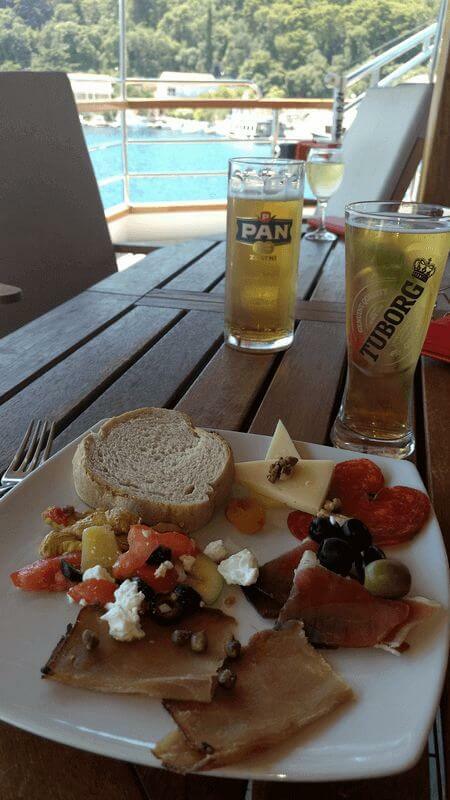 Catering starts with the dinner on the arrival day and ends with the breakfast on the departure day. Please do not forget that the ship is your hotel as well as a machine, which has to be maintained and operated – day and night. A certain level of noise is therefore inevitable. April 14, 21 und 28; May 5, 12, 19 und 26; June 2, 9, 16, 23 und 30; July 7, 14, 21 und 28; August 4, 11, 18 und 25; September 1, 8, 15, 22 und 29; Oct 6 und 13. 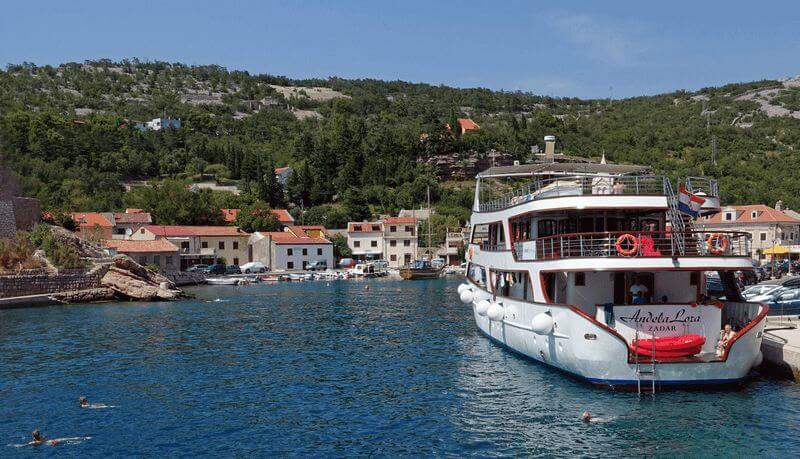 On April 21, May 12 and 19, June 23, July 7, Sept. 15, Oct. 6 and 13: The hybrid bike cruise Kvarner Bay and the mountain bike cruise Kvarner Bay standard are operated parallel on the same boat. One tour guide will attend the hybrid bike group while the other one will guide the mountain bike group. The detailed itinerary of our Kvarner Bay MTB trip can gladly be sent to you on request. • With three persons sharing a cabin, we allow a 50 % discount on the basic tour price for the third person, regardless of age (only possible below deck/not combinable with other discounts). • Children up to age 16 receive a 25 % discount on the basic tour price (not combinable with other discounts). Surcharge for single cabin use will be added. Overview-maps for the daily tours on board (on board). Tips for tour-guides and crew (at your discretion). – In case of train arrival: Collecting transfer from Rijeka train station to Omišalj: €20 person/way (reservation requested). Please note, that it is not possible to take your own bike in trains. The cycling routes require a basic level of fitness, which you should have acquired by steady cycling. The routes can reach an altitude of 200 to 500 meters. The daily routes, of 20 – 45 km/12 – 28 mi., cover hilly and mountainous terrain and can be completed without time constraints. You will also come across some longer and rather steep climbs, where walking your bike is of course permitted. The tour guides will inform you about the course of the tour in due time. This tour is primarily a guided group tour. Upon consultation with your tour guides, the possibility to cycle on your own along recommended, suitable routes, may present itself. Boat Bike Tours is not the operator of this tour; this is a so called ‘partner tour’. Tour operator is: Inselhuepfen/Radurlaub Zeitreisen GmbH, Konstanz, Germany. Other conditions may apply to this tour: further details on request. Guides Marco, Gabriel and Aggie were the best! Welcome aboard of the wooden motor yacht Linda. The spacious saloon is the perfect spot to get yourself drink and enjoy a healthy breakfast and tasty three course dinner. The middle sundeck is constructed in such a way that meals can also be served outside. Fans of sunbathing can seek a matrass on the large sun roof. The cabins are below deck (3 twins with portholes, and 1 double with an extra bunk bed) or on the main deck (6 doubles and 4 twins) and all of them have air conditioning, a cabinet and a small bathroom. All bicycles are equipped with a precise Shimano gear shift, Shimano V-brakes with strong “bite”, 28 inch hollow chamber rims with quick clambs, safety mudguards and a comfortable touring saddle of Selle Royal. Our hybrid bicycles are basic bicycles with trapeze frame or diamond frame that are available in four frame sizes: trapeze frame in 46 and 52 cm or diamond frame with top tube in 56 and 60 cm. Please be aware that these rental bikes are only available for participants that are taller than 1.50 m.
E-Bikes of the brand Cube Cross Hybrid Pro Allroad 500. Our e-bikes are characterized by their light weight (20kg without the battery installed) and their ability to ride in varying terrain. This model is fitted with a performance motor and a 500 WH battery. The 9 gears are perfectly in tune with the motor and are easy to operate. We offer a trapeze frame for all guests up to 179 cm, and a diamond frame for people 180cm+. Weight Limit of Clients Bicycles Brought on Board Please be aware, that we have a weight limit of 22 kg (48.5 lb), if you bring your own bicycle/e-bike on board of one of our boats. This limit is important to protect the health of our guides/crew members, than they have to lift the bikes on board. If we consider it necessary, we will check the weight on site. If the weight limit is exceeded, we reserve the right to refuse taking the bike on board.